Anderwerks News: Who is Lawrence Bird? Lawrence Bird was the oldest and longest serving BMW Motorcycle Dealer in Canada. He was a man who lived his passion... 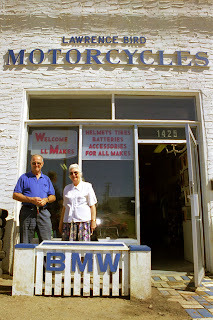 motorcycles...He operated his workshop with his companion Joyce for over 40 years, in Brandon MB. While providing service to the marque, he had seen 3 national BMW Motorcycle Distributors come and go, in Canada. He also proudly represented, serviced and sold, Harley Davidson, Vincent, Norton, Triumph, Moto Guzzi, Yamaha, and Hodaka, from his small shop in Brandon. In 1998, BMW Motorrad Canada decided his small workshop no longer fit their new corporate image, and refused to continue business with him, and removed his privileges to officially represent BMW. He continued to service BMW as an independent, for the last years, before closing the shop, and retiring in 2001. With this ride, we have chosen to continue to re-visit one of his favorite places, a ride he would do most long weekends, from Brandon, to enjoy and live his passions of motorcycles and photography, in the Waterton-Glacier International Peace Park. We welcome anyone who rides to join us, on some of the finest motorcyling roads in North America.